I think you’re going to enjoy the rest of the series, Jacqui. I was amazed how Powell kept introducing new, fascinating characters. Don’t worry though as most of the older characters re-appear at some point. I really liked Uncle Giles as well. Thanks, that’s good to know. I am beginning to get that sense of characters appearing briefly, then cropping up again a number of years down the line. Quiggin and Manners, for instance. Hopefully I won’t have too long to wait before Uncle Giles steps back into the frame. Great review, Jacqui! I had read A Question of Upbringing some years ago, but then for some reason never went on to read the rest of the books in the twelve part cycle. As a result, I had no recollection of the book other than some vague impressions, until I read your review. I now find myself in a position where I want to continue with the series, but do not want to re-read the first book. However, now that I have some idea, maybe I will delve straight into Book 2 and see how it goes. Firstly, the good news is that Powell lands the ending. Obviously I won’t say anything about how the series progresses, but I do think it’s useful to know when starting a 12 volume novel sequence that the whole is greater than the parts. Anyway, lovely review as ever Jacqui. It is good isn’t it? When I read these I committed to reading them as every other book I read – i.e. I read whatever I fancied, then a Dance, then whatever else struck me, then a Dance. I’m not remotely saying that’s necessary, but it helped me work through them. Anyway, you’ve a definite treat ahead. I have so many memories of these books and the characters in them. It’s hard to pick favourites. Looking forward to seeing how you get on with them. Yes, wonderful. On the basis of the first book alone, I can tell I’m going to be in for long haul. It’s good to know how you felt about the series as a whole, both the nature of the ending and the synergistic effect across the complete cycle. As you say, it’s useful to have a sense of that at the outset, a sort of reassurance that the series is going to be worth the investment in time. As for the pacing, that’s a good way of approaching it. I may well do something similar, although probably one every third or fourth book rather than one in two. It feels important to leave a bit of space between the volumes, just to clear the mind a little – but not too much in case the characters and their circumstances begin to fade. One thing I neglected to mention in my piece (in fact it’s probably only just struck me) is Powell’s references to paintings – not just the eponymous Poussin, but other works of art too. Maybe I’m just imagining it, but they seem to crop up every now and again in relation to character and scene. Was that something you recall noticing too? Great review as always Jacqui. The book sounds like a great start to what seems like an ambitious series of novels. I also took a look at the Wikipedia entry entry on the series. The whole thing sounds a little like Philip Roth’s Zuckerman Books. Powell’s works were first however. All the books look to be worth reading. Thanks, Brian. It does feel like an ambitious series, a sense of range or scope alongside the minutia of character. I’m looking forward to see how it all unfolds in the future. That’s an interesting comparison to Roth’s Zuckerman books – not a series (or writer) I’m terribly familiar with, but I know they are very highly regarded. I’ve picked up some random volumes from the series over the years, but never got round to starting it. I recall the TV dramatisation some years ago, but didn’t catch all the episodes, so obtained a rather disjointed impression. Maybe I deliberately did this with a view to reading them first; dramatisations can often spoil a subsequent first reading, I find. I remember Simon R Beale as Widmerpool as a standout performance. Just looked it up online: it was way back in 1997! If it’s any incentive, I think you’d have a ball with the books. The insights into character are both detailed and fascinating, a joy to behold. No, I saw trailers of the Stalin film when it came out, but never got to see it. Will look out for it. I’m a big fan of Mr Beale, too. It’s ruthlessly funny, very sharp and cutting. Well worth a watch. Oh, that’s wonderful about Widmerpool. I definitely get the sense of there being so much scope for the development of his character, just from the first book alone. It’s one of the joys of a series like this, that sense of returning to old friends – even when the characters are a million miles away from your own sphere in real life! I’m so glad to hear that you loved the series too – that’s very reassuring. Lovely review, Jacqui but I don’t see myself embark on this journey. Twelve volumes is a lot. But the quotes are wonderful. Danielle from A Work in Progress read and reviewed it ages ago and I remeber her liking it a great deal to, just like those who commented here. Thanks, Caroline. It is a big commitment, one I’m very happy to make, but I know it isn’t for everybody! I should read this set. “Sillery”–I keep seeing and hearing Mr Samgrass from the 80s Brideshead tv version. That’s how my day is going I suppose. Excellent summary/review. Samgrass…it’s been such a long time since I read Brideshead I can barely recall the supporting characters. Sillery is very slippery, if that makes any sense! Yep–Samgrass was a fat little troll but slippery and oily to the adults with the money! Ha! You’re making me want to go back to Brideshead for a refresher. I was thinking of him in the 80’s tv version with Jeremy Irons and Anthony Andrews. It’s probably on youtube! I have started this series 3 times, and for some reason, I don’t get beyond the first three books, despite enjoying them hugely. It may be time to make a fourth attempt. I haven’t read them back to back as it were, its just for some reason that I don’t seem to time right the embarkation into book 4! Oh, interesting. Is number 4 the start of the ‘War’ section, by any chance? I’ve heard that can be the most challenging part to get into… As you say, maybe a back-to-back approach is the way to go for you. Personally, I think I’d need to read something else in between each volume, but a full-on blitz would have its merits! Ah, no worries at all…I think it was my misinterpretation of your original comment! Mind you, that’s a good point about the sequencing of the original publication dates – it must have been hard for readers to wait 2 or 3 years for each new instalment! I hope you do find a way to get back into the series at some point. Everything I’ve heard suggests it’s worth the investment in time and energy. I loved this sequence of novels, though Powell isn’t always easy. I so enjoyed spending time watching these characters develop and of course age throughout the sequence. Such memorable, vibrant characters and the opening to this first book is very memorable to me. Yes, the imagery in the opening section is very vivid, isn’t it? The workmen warming themselves by the fire in the street on a cold and wintry day. It’s so easy to visualise in the mind. I think I’m in for the long haul now, challenging passages and all! I came close to buying the whole set when a second-hand bookshop went out of business not too long ago, but hesitated when I flashed on an image of my limited shelf-space. Still, I’m tremendously curious about the series and look forward to following your reading of it. And how nice for you that you’ve freed up your time now to take on something this big and immersive! In the meantime, you can read along with us vicariously, so to speak, enjoying the delights of Jenkins, Widmerpool, Sillery et al as the sequence unfolds. .
Oh I’m tempted all right, so thanks. But given that I’m not even halfway through one 1,700 page work and only a fifth of the way through another monster, I wonder…but whatever plans I have for reading seem always made to be broken. Ah, Uwe Johnson’s Anniversaries. I hope you get a chance to post about that at some point. I’m curious to hear more. Good luck – I admire anyone for even reading a long book, but this requires particular commitment. I look forward to reading about it. What a treat in store for you Jacquie. The books, in my view, get better and better. Widmerpool is one of my favourite literary characters, funny but quite terrible. That’s great to hear, especially as I enjoyed book one so much! Widmerpool definitely feels like a focal point, even at this early stage in the sequence. Some priceless moments ahead, no doubt. I started reading The Dance two years ago but I’ve only completed Spring so far. Must get back to it ! The fourth volume is At Lady Molly’s, and it’s not about the war yet, it’s about married life, but Hitler is looming in the background. The war occurs in the third part, Autumn. Oh now I can’t wait to pick the series up again where I left it ! 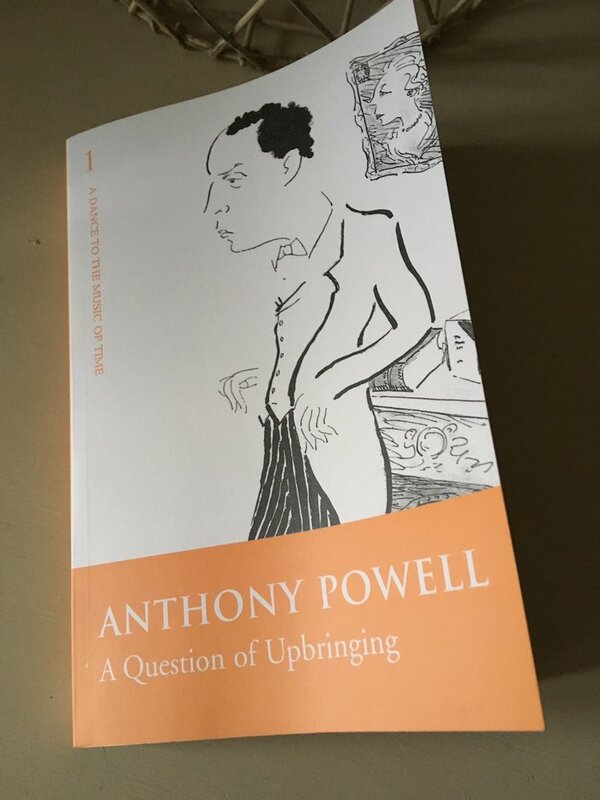 And do have a look at the Anthony Powell Society online, it’s very helpful. I often turned to it to refresh my memory about characters I’d forgotten, but they also provide lots of essays on each book. Enjoy ! Ah, thanks! I will definitely take a look at the AP Society website. It sounds like a great resource for insights into the sequence. I’ve been a little worried about the challenge of keeping all the various characters in my head as the sequence unfolds, so it’s good to know there’s help at hand if I get stuck (which I undoubtedly will). Best of luck with the rest of the series – I hope you get a chance to return to it soon! You know, for some reason it doesn’t feel like a major undertaking – possibly because I enjoyed the first two books so much (I’ve just finished the second, A Buyer’s Market). Also, I’ve pretty much decided that I’m not going to write about each book, which takes the pressure off somewhat, particularly in terms of trying to say something about them without revealing any spoilers! I’m just going to enjoy the experience and see where it takes me. How have you been getting on with Pilgrimage? I’ve noticed quite a few people reading it over the last two or three years. That’s great to hear Jacqui and I’m sure the no pressure approach is the best to take! Excellent review, Jacqui. I really admire you embarking on such a huge read, my experience is that there’s a certain mindset needed (the headspace you mention at the beginning, I think) but they are also hugely rewarding. I think at a time when our attention is so clamoured over, being able to focus on something which takes investment is a truly valuable activity. It also sounds like the initial book, at least, suggests the rest of the series will be worth that investment of time. I look forward to reading about the remaining books you choose to write about. Thanks, Belinda. The series feels like a good fit for me, especially given my interest in the era. I’m sure it will be worth the investment in time and mental energy, plus I’m intrigued to see how Widermerpool shapes up as the years go by.